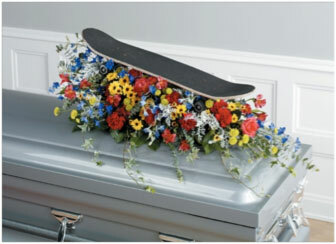 While it's hard for me to think about losing my sons or anyone in their circle of friends, I think this floral tribute to a skateboarder would bring smiles to those in attendance at the celebration for their life. It retains a sense of playfulness so much a part of a young person's spirit – or even those adults I see frequenting the local skate park! The board 'rides' on a colorful bed of flowers, which to me speaks of the rider's buoyancy and delight while pursuing this personal passion. Many of the mothers and grandmothers I know enjoy scrapbooking. Now, I've got to tell you; it's not for me: there's just too much work involved. I'm one of those people who toss photos and keepsakes in boxes and drawers – always hoping I'll find the time and inclination to gather them together in an album, or in this case, a scrapbook. For those who are inclined to this hobby – and I know there are a lot of them, because of all the scrapbooking Web sites around the Internet – a floral tribute like this next one would surely please and comfort those who were in attendance. If you really want to take a playful stance, you could also see it as pleasing to the spirit of the deceased. 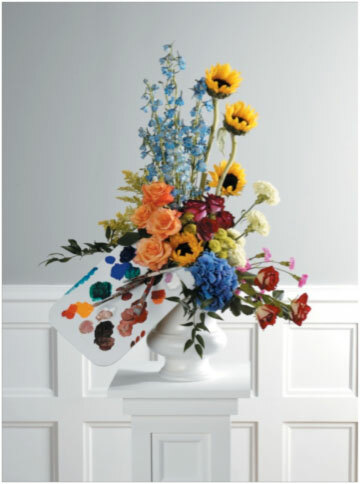 No matter who you are, no matter what age upon death, there are personal traits and activities you could tap into for one-of-a-kind floral tributes. My heart is warmed by the artist's tribute arrangement, and I know many artists who would consider it worthy of an oil or water color study. 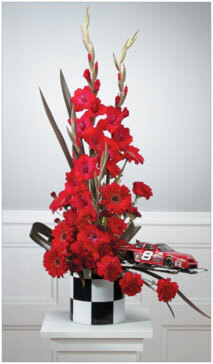 And what can you say about the sailor's tribute arrangement, except that it's beautiful? 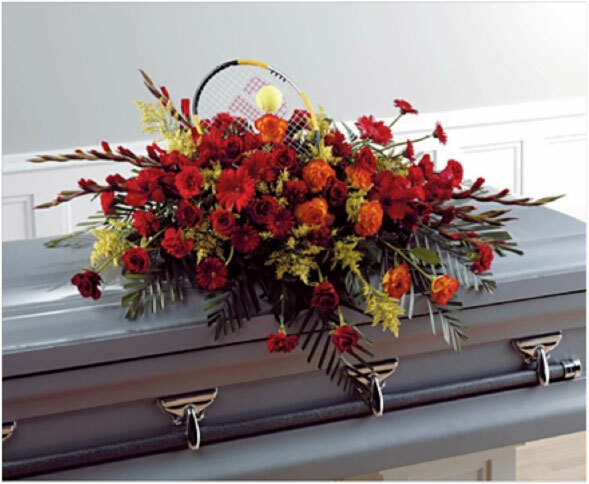 For those who love tennis, there's this stunning casket spray, incorporating their beloved tennis racket – the singular tool that brought them so many victories on Saturday or Sunday afternoons. Through personalized tributes, you can feel a greater sense of closeness to your loved one, instead of holding a traditional, cookie-cutter funeral. 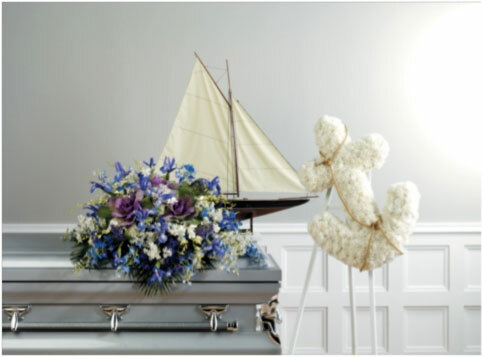 A personalized memorial gives you the freedom to talk about the life of the person you've lost. 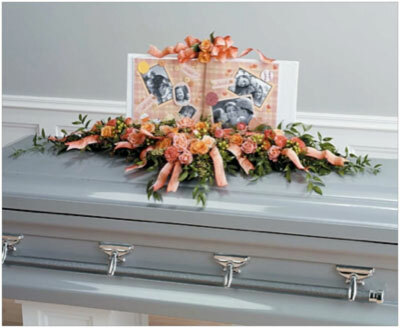 While your funeral professional will have many ideas to help you personalize the memorial or funeral service, there are things you can think about before sitting down with them to discuss available options. As you think about personalization, turn your thoughts to your memories of the person who died. Think about his or her qualities, and what they meant to others. Consider their passions, hobbies, pastimes, likes and dislikes. Sometimes it's best to do this with family and friends; grief can be overwhelming for many, and cloud your thinking.